Guaranteeing high quality and precision products while trying to meet the most varied customer requests through production flexibility, product customisation, and a complete package of assistance services: that is CM Automazione’s mission. This company based in Giussano (Monza e Brianza, Italy) is specialised in the design, production, and installation of industrial handling systems. ipcm® had the opportunity to interview Stefano Crotti, who started this business in 1999 together with Giuseppe Moscatelli, to present the history of a company that has succeeded in establishing itself in the automation and industrial handling sector in just twenty years, thus becoming a benchmark in the Italian market. The firm is now planning to strengthen its presence also at the international level. ipcm®: Can you briefly illustrate to our readers the evolution of the company from its foundation to today? SC: CM Automazione’s history started in 1999, when Giuseppe Moscatelli and I decided to establish this firm based on the long-standing expertise gained in the technical office of another company in the sector, which enabled us to get to know our product and target market very well and to be able to produce high quality handling systems. During these first twenty years, we have achieved many of our goals. One of the most important was switching from manufacturing only one-rail lines to producing more complex systems, i.e. simple and dynamic (power & free) two-rail conveyors managed through software developed and tested in-house. The choice to start producing power & free conveyors called for a change of vision and target market. At first, our customers could only be producers of coating plants. However, thanks to the development of our internal resources, we have acquired the skills and capabilities to collaborate directly with end users. Another key moment in the history of CM Automazione was 2011, when we acquired the well-established company FA Ganci (Modena, Italy) and thus expanded our offer with part hanging systems such as hooks, bars, and specific accessories for coating plants that can be tailored to user needs. ipcm®: What is your core business and what are your target sectors? SC: The company’s core business is the design and implementation of internal handling systems, overhead and floor conveyors, one-rail, two-rail, and manual conveyors for coating plants intended for a wide range of products such as wooden doors and windows, aluminium profiles, plastic parts, iron, steel, and automotive components. In some market niches, we have been true innovators: in the enamelling sector, for instance, we were the first to offer handling systems for applying enamel on exhaust pipes. ipcm®: How is your production department structured? SC: CM Automazione covers a 3500 m2 wide area, two thirds of which are dedicated to production. In terms of resources, the company has around 10 employees and longstanding collaborations with a few contractors. A large space is devoted to the activities of development, realisation, assembly, testing, and quality control of our plants. We design and manufacture most of our components in-house, such as rails, curves, drive units, and lubricators. Our handling system can also be equipped with customised two-plane chains in order to meet specific customer needs. Our robotic welding department and the use of specific jigs enable us to supply hooks and coating equipment designed and created based on the workpieces’ size and the chains’ overall dimensions, thus optimising the yield of the plants and, therefore, their production capacity. The possibility of including both the construction of the handling line and the customisation of its hanging system in our offer allows us to fully meet the end users’ needs and forge partnerships with national and international installers. 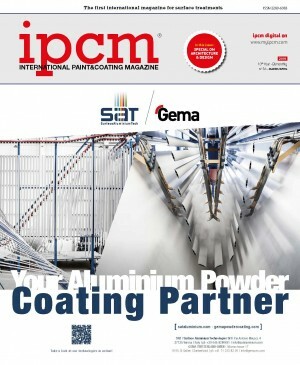 ipcm®: The evolution of CM Automazione was marked by the launch of a power & free conveyor designed by you. What features distinguish this and your other products? SC: Flexibility is the key element that unites our products. Offering modular one-rail and two-rail handling lines means to offer versatile systems that are easy to assemble and disassemble and extremely adaptable in terms of arrangement. Depending on the characteristics of the lines, such as, for example, their length, their windingness, and the weight of the loads to be handled, we are able to develop specific designs to create customised solutions. The innovation introduced by our power & free system is the possibility to implement curves with a very narrow radius thanks to the use of steering trolleys. 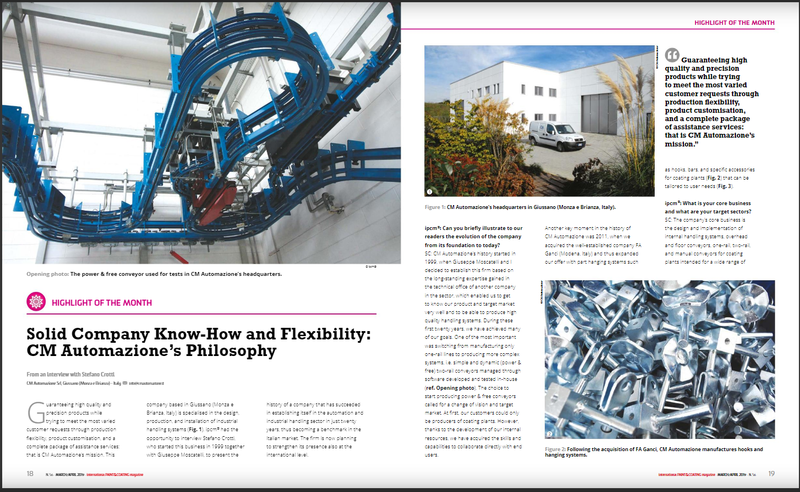 ipcm®: For CM Automazione, being flexible also means to offer revamping solutions for already existing plants. Not many companies offer this service. Why this choice? SC: Both in the national and international market, there is a large number of conveyors that are obsolete or not in perfect operating conditions. no longer exists, the technologies have changed or been updated and spare parts are no longer available. CM Automazione decided to meet these needs: after a brief analysis of the existing line, our engineers identify its critical areas and determine if it is necessary to replace the entire handling system or if only obsolete components can be replaced. ipcm®: What does the revamping of a conveyor involve? SC: The goal is to solve the problem. If possible, the rail circuit is maintained, i.e. the track and its support structures. If necessary, worn curves are replaced and a more or less radical intervention is carried out on the drive unit and the two-plane chain. One of the most involved components in revamping is the lubrication system, as old oil emulsion lubricators no longer comply with current legislation. ipcm®: What goals have you set for the short and medium term? SC: Once we have established our presence in the industrial handling and automation sectors, we aim at expanding and strengthening our position in the international market through the development of new channels. That is why we have undertaken new communication and promotion strategies, which have led to the launch of our new website and to our collaboration with international magazines in the industry. It is the beginning of a journey that will lead us to further growth and evolution.